Welcome Amy Raudenbush! Amy is now the Fruit IPM Program Associate working in blueberries. A native of New Jersey, Amy joined the Fruit IPM Program this past Tuesday, July 8. After getting a Bachelors degree from Rutgers and working in the Entomology Department, she received an MS in Entomology from Kansas State University, and worked as a research associate in IPM programming. Amy is now visiting with growers and assessing SWD populations, along with other pests. Amy is stationed in the Rutgers Cooperative Extension Offices of Atlantic County, and will be able to be reached at (609)625-0056 or by her cell number at (609)313-2406. Thrips: Thrips have been found feeding on ripening nectarines in southern counties. Effective materials for thrips control include Delegate at the high rate, and Lannate. Of these Delegate provides the best control. Hot and dry conditions are favorable for thrips. Brown Rot: Some rot has been seen in ripening nectarine blocks and a few peach blocks. Where brown rot is present, this presents very high inoculum levels for disease control of the existing clean fruit, both within the block and in surrounding blocks. If practicable, removal of rotten fruit from the orchard will aid in control in affected blocks, and possibly the edges of adjacent blocks that have not yet begun to ripen. Rotate fungicides and maintain a tight program. Wooly Apple Aphid: Wooly aphids are appearing in some blocks in southern and northern counties. We have had significant biological control in past years so it’s worth waiting to treat. 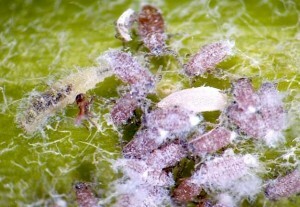 When scouting, examine the colonies by gently removing the “wool” and look to see if aphids are alive or dead. Beneficials that we have observed feeding on wooly aphids are syrphid fly larvae, and parasitic wasps. We have no established threshold for treatment, however an average of 10 colonies per tree would be conservative. Effective materials include Thionex, Diazinon, and Movento. Neonics such as Admire Pro, Actara and Belay, generally provide good control of shoot infestations but will not control colonies feeding on woody plant parts. Codling Moth (CM): In southern counties, the time to treat for codling moth will be on or about 7/10 and 7/20. If using Intrepid, applications need to go on 1-2 days earlier than if using standard materials. Do not use trap counts as a guide for this second generation degree day timed spray. Treatments should be completed at the optimum timing with the correct rate and volume. After 2 complete CM treatments have been applied, then trap counts can be used as a guide to help determine the need for supplemental applications. This pest is an internal worm that will need to be targeted along with brown marmorated stink bug (BMSB). European Red Mites (ERM): Mites continue to be troublesome, and we have observed control failures in some orchards. If using Zeal or Envidor, evaluation should be done 7-10 days after the application since these products take time to work. The addition of a summer oil combined with a miticide has helped in the past. Do not use any oils with or close to Captan applications. Brown Marmorated Stink Bug (BMSB): Populations are present but very light. Heavy pyrethroid use last year for BMSB, may have helped contribute to late season mite populations, which laid overwintering eggs and produced mites for this year. The hot weather is now aggravating those mite populations. Given these difficulties, the use of those pyrethroids in border sprays, but not the block interiors may be a way to help mitigate this problem for next year. The use of frequent border sprays for BMSB is showing to be an effective practice to help control this edge related pest. Grape Berry Moth (GBM): Treatments are due now in northern vineyards. Check along vineyard edges and border rows near wooded areas. Most GBM in northern counties should be adults, and laying eggs that are starting to hatch. The timing for treatments in southern counties was just prior to the 4th of July. Grape Root Borer (GRB): GRB adults have started to emerge. While it is easy to capture GRB adults, a trap capture Does Not mean that you have a problem. The adults could be coming from outside the vineyard, or from inside the vineyard. Careful scouting for pupal cases (signifying emerged adults), around the base of vines is the only way to know if you have a problem. Trap captures do mean that adults are flying, and will mate and lay eggs in the near future. Redbanded Leafroller (RBLR): Adults are now flying. These are second generation adults which will mate and lay eggs that produce larvae during the middle of the month. It is highly unlikely that RBLR will be an issue, and even if larvae are seen, most berries will have already been harvested. Putnam Scale: Scale is present on at least 4 farms at treatable levels. We are in the process of installing “tape traps” to monitor the crawlers. The immature crawlers should start to emerge late in July or early August. Any growers who have noticed scale on their berries are sure to have bushes that are under stress from scale populations. Keep a record of which fields these berries are from and plan to treat those fields when crawlers are present. Coverage is the name of the game for scale control. For full size bushes nothing under 40 gal per A is suggested. You can use either Diazinon or Esteem, but if you used Diazinon once already then you cannot use it again. Esteem has a longer residual, and can be applied after the first week of crawler emergence. More on this later when crawlers emerge.